Barcelona are "in a hole" and "finding it difficult to score goals" admitted boss Luis Enrique following their shock Champions League quarter-final defeat. 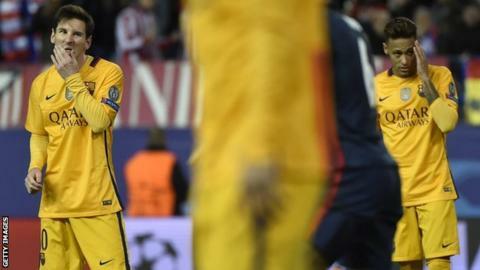 The holders were beaten 3-2 on aggregate by Spanish rivals Atletico Madrid, who won the second leg 2-0. "The team are sad. We aren't at our best at the moment, nor our most effective," he said. "I'm 99.9% to blame, no 100. That's why I am the coach, the most responsible. We all have to improve." Antoine Griezmann scored both goals for Atletico at the Vicente Calderon, while Lionel Messi failed to net for the fifth club game in a row. "It is clear that we are not in our best form, especially if you consider how we were playing before, but we need to lift ourselves," added Enrique. It is only the third time in 11 years that Barcelona have not reached the semi-finals of the Champions League. They are three points clear of Atletico at the top of La Liga, but have lost three of their past four games in all competitions. "It was the game we predicted, although perhaps I didn't expect Atletico to play so deep. It wasn't our best day," added Enrique, who won the treble in his first year in charge at Barca.